Remedial Sweet Itch Clipping with a twist! This morning kicked off with a remedial sweet itch summer clip with a creative spin for this pretty lady! 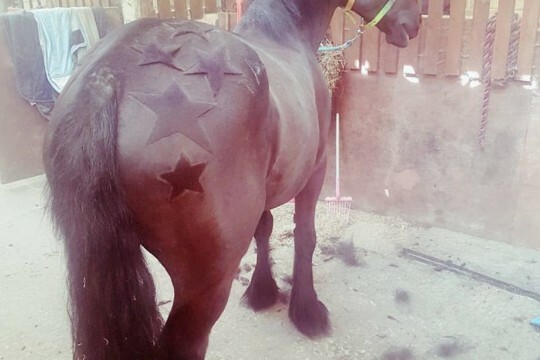 Often horses benefit from all year round clipping and sweet itch sufferers are no exception! Think: remove the itchy coat that is holding all the scurvy dandruffy bits inside followed by a thorough wash down. The skin is much clearer / less of an enjoyable environment for the pesky flies to bury into = less fly saliva = less sweet itch irritation. Also it is easier to apply topical potions on a daily basis without build up of dirt and grease when the coat is short. Applying petrolium jelly and topical creams such as sweet relief ( bite back products) have been the most successful in my experience. Struggling with your sweet itch horse and needs some advice? Give me a call I’ll happily talk you through my experiences to help in any way i can. Oh the difference a mane pull makes!